Our first PSW meeting of the year was an absolute corker! Incoming President Vera Meyer, opened the evening with a warm welcome to fresh faces and returning members. Melissa Ballantyne – Installer, Educator Founder of Sydney Stingless Bees. The TC hive comprises of: one queen and thousands of workers who live together in a protected place, which, in nature, is usually in a hollow tree. Man made hives are constructed as a set of two deep trays, when the open faces open are brought together, the 2 trays form a cube which is taped up and the bees go to work filling the inside gap with Propolis. One or two small entrances are created in order for the bees to depart, enter, defend and ventilate the hive. TC inhabit the northern parts of Australia, although on the east coast they reach to around Bega. 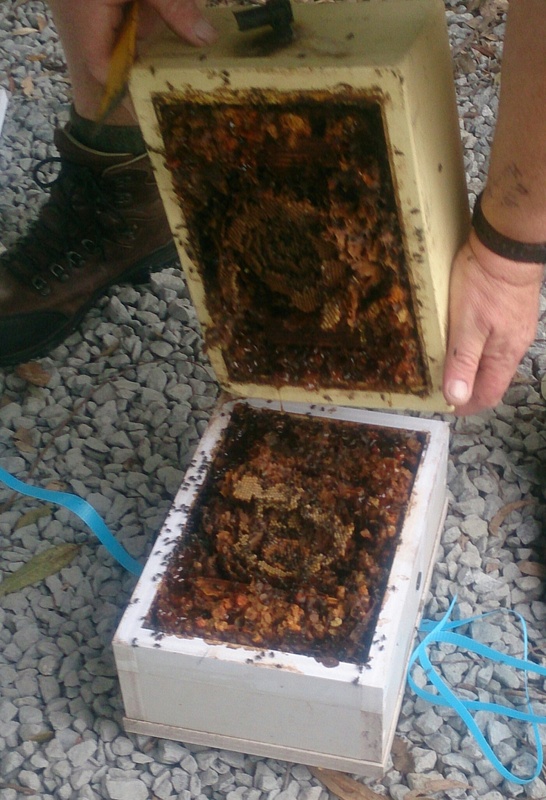 TC Bees emerge to forage when the temp reaches 18c. Australian native bees not only pollinate Australian Natives trees and vegetation, they are also efficient pollinators of fruit and vegetables. 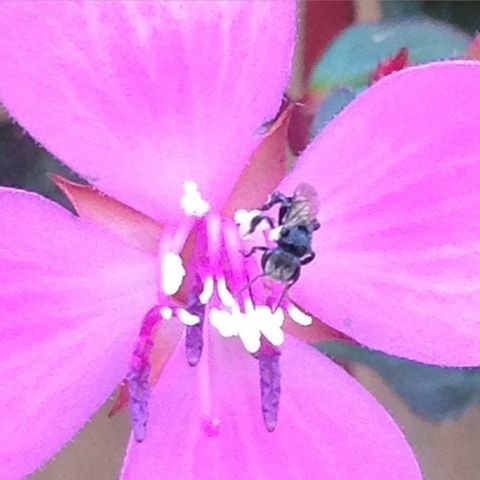 Large is not always good, these tiny bees can pollinate even tiny flowers which larger pollinators my not. Tetregonula Carbonaria are notable pollinators of macadamias. The internal entrance and surrounding structures of the nest are coated with a smooth thick layer of black, red or yellow cerumen which is a mixture of propolis and their own bees wax which is secreted from a gland on the underside of their abdomen. The four hive corners, contain a matrix of large globular pots which are constructed by worker bees. These larder pots are each filled with either pollen or honey and is available food for the entire hive. 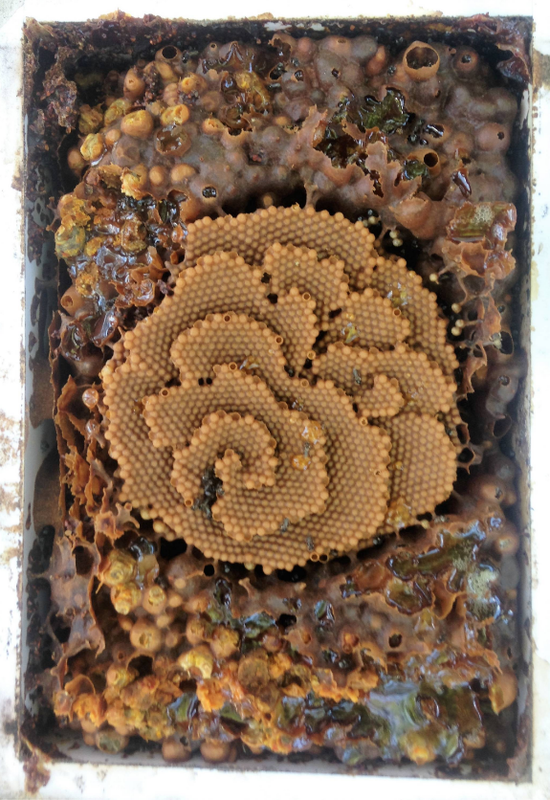 Fascinatingly, each Tetregonula Carbonaria Brood section, creates its own pattern type; presenting as a set of hexagonal cells, which are joined in a single layer to form an escalating plate like spiral formation, which in turn, is built around a central supporting spindle like core of wax. The outer edge of the brood formation is known as The Advancing Front. The worker brood cells, are formed by worker bees. Forager bees may return with pollen or nectar and may be transferred to each brood cell or larder pots. The queen lays a precious egg into each fully prepared cell; a worker bee closes the cell with wax. Then complete larval and pupal development occurs in the closed cell. Emergency Queen Cells are formed upon the Advancing Front by fusing two regular worker cells together. Royal Jelly is secreted into these cells by the worker bees from a gland near their mouth parts, the queen lays an egg and the cell is capped. Thus, the New Queen is brought forth..
by being fed the ultimate diet! Installing these tiny black insect pollinators into one’s environment is as easy as purchasing & positioning the hive where they will receive winter sun and summer shade. Splitting the Hive every 12 to 18 months depending upon the weight, approx 7kg is good. You need to cover each split with another open tray to create the enclosed cube and tape the central join, which the bees will glue together with Propolis on the inside. Heat Wave Conditions, extended heat above 45 deg c.
Simply close the hive at night by capping the entrance and popping in a cool room with the entrance cap in place for a few days before reinstating the hive to a safe spot when the heat wave is over. Cold Wind or Rain I choose to cover my hive with a foil windscreen shade. Spider Webs -Remove any spider webs around the hive, especially across the entrance. Hold A ‘Release the Bees’ Ceremony upon arrival.